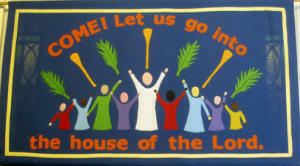 The Banner Group was formed in the autumn of 2005 to make two banners for the church for Christmas. 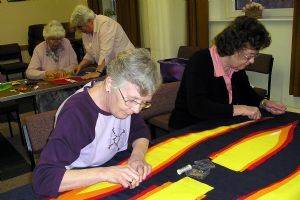 Co-ordinated by Pam Frost and six other ladies - Pauline Halford, Pauline Hillier, Joyce Roberts, Carole Smith, Pam Spiby and Maureen Walbey - they met regularly to sew and embroider. 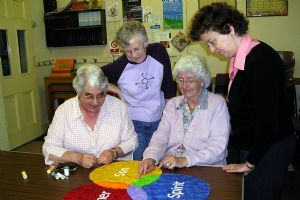 The group would not profess to be anything other than enthusiastic housewives using their sewing skills, as we work happily together - as an act of worship to the glory of God. 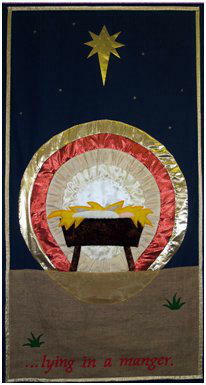 The designs for the Christmas Banners were original but one (the manger) was inspired by a charity Christmas card. Preliminary work included drawing full scale patterns from the rough sketch plans, purchasing the materials and threads required and making up the banner 'bases'. These jobs took some weeks. 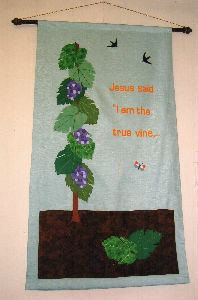 Two Easter banners were produced early in 2006 followed by two made on a 'Harvest Theme', using John 15: 1, during the summer of that year, which are now part of the yearly rota. 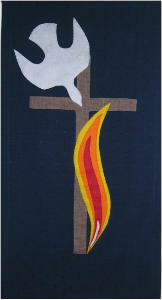 Banners for Pentecost and Trinity Sunday were started in March 2007. 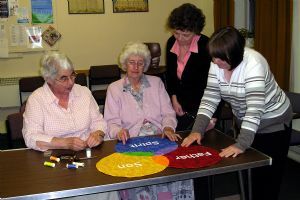 Over spring 2008 the Banner Group completed two new banners. 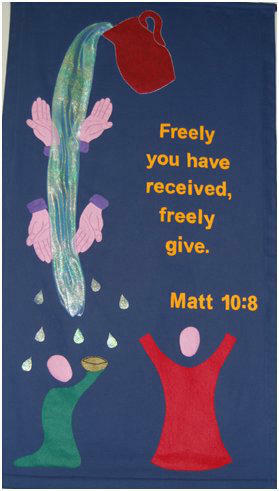 These are on general themes – loving and giving - suggested by some seen in Broad Haven Baptist Church, in Wales. 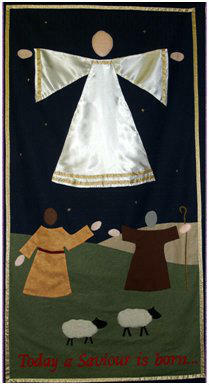 They were put up in church for the first Sunday in July and will be used in rotation with the rest of the banners. Late in 2009, two of our members, Bob and Ruth Ellett, visited Nepal where they had served with BMS for 13 years. 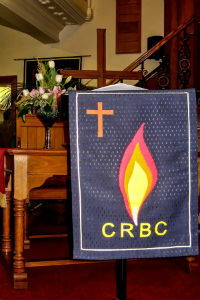 The banner group were asked to make three banners to be taken as gifts from CRBC. 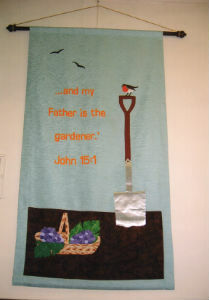 These were smaller than those hanging in church. 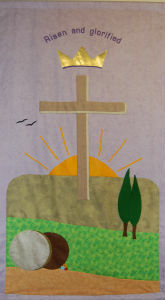 Two were based on banners already made for church and the other was a new design - 'Peace'. 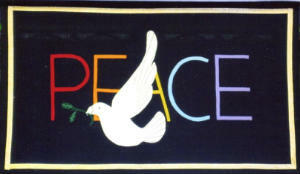 Our Pastor promptly ordered another 'Peace' banner which was hung at the back of the sanctuary. 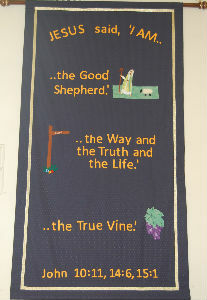 Early in 2011 we produced another smaller banner which is displayed in the church vestibule. 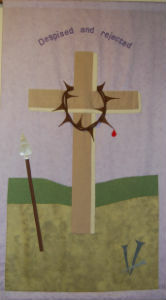 When the large Fellowship banner was hung at the back of the church, the Peace banner was placed at the front of the church to the left of the pulpit. 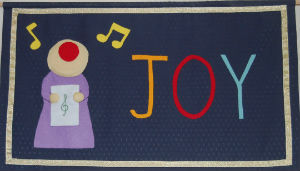 In the summer/autumn a Joy banner was stitched to match the Peace banner to hang to the right of the pulpit. 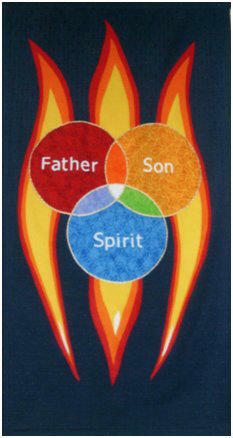 This was presented to the Pastor on 9 November 2014. 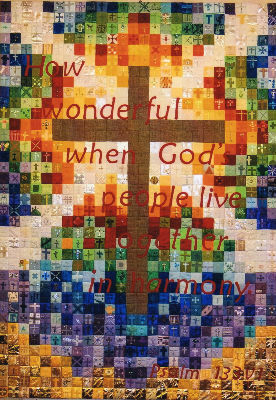 In late September 2014 it was decided to take the 'Loving and Giving' banners out of the rota and hang them permanently in the gallery. 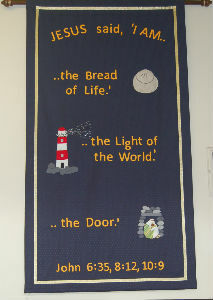 Two new banners on a more general theme were needed to replace them. 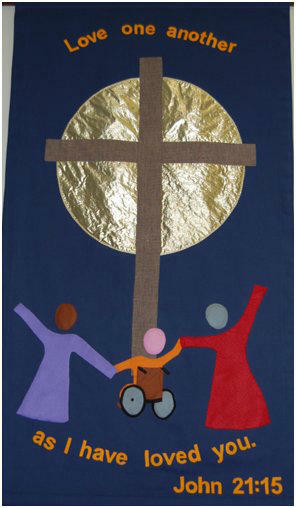 The Banner group - Sandra Baxter, Pam Frost, Pauline Hillier, Beverley Sutton and Maureen Walbey - met and discussed this and decided to make two banners and a 'strip' banner depicting the seven "I AMs" of Jesus. These were completed in February 2015. 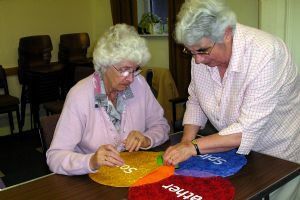 The group were then given one more commission! 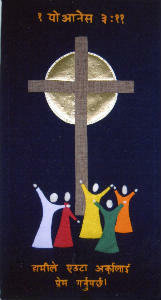 - to make four falls for the IGnight music stands and one for the Pastors music stand. These were dedicated on Palm Sunday 2015. Pam Frost was presented with a plant to thank her for all her inspiration and hard work as Banner Group Leader over many years. 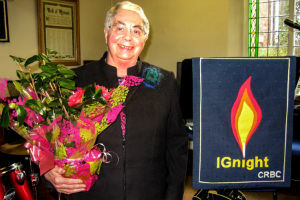 She is pictured with the latest music stand falls which have been made for the CRBC IGnight band.